Charging the Earth - Solar! : Alternative circuit, delivering solar energy direct to GSHP? Alternative circuit, delivering solar energy direct to GSHP? 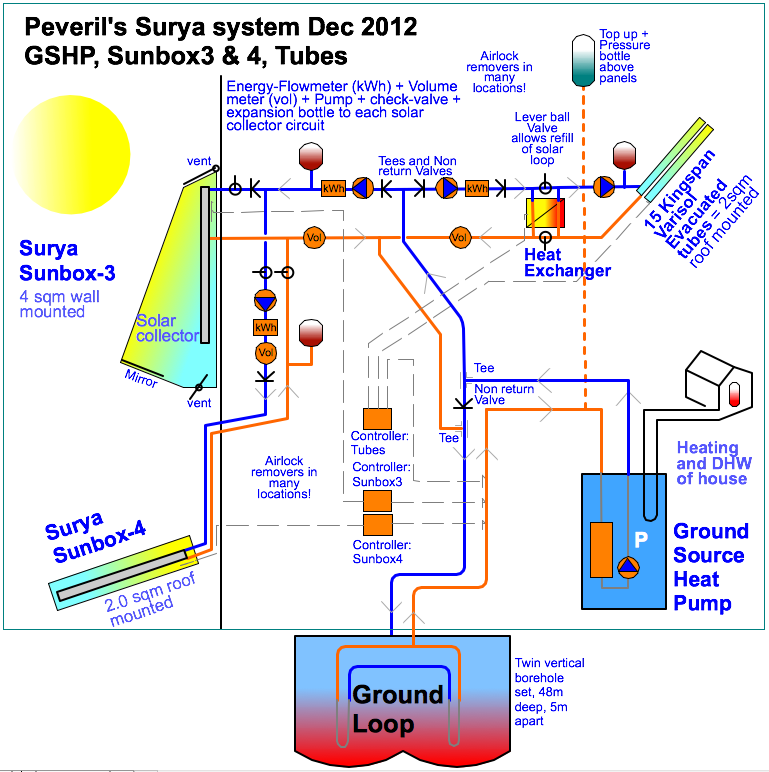 14 Feb 2013: Warmed liquid from the solar panels always goes through the ground loop first before being fed to the GSHP. 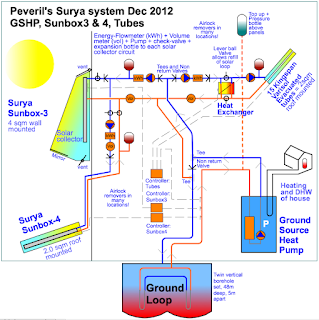 I am often asked why the solar panel hot liquid cannot just be fed direct to the GSHP, to get the most instant delivery of thermal energy. The plumbing would be easy, but operationally it would be too troublesome and the electrics would be more complex. The prime reason it should not is that in summer, the GSHP is on for only about an hour a day for hot water, so the solar panel circuit can get up into the 40s. The sudden introduction of a liquid in the 20s or higher would be interpreted as a serious malfunction by the GSHP, which would promptly result in a shut-down. Secondly, while this could be overcome by using solenoid valves and a mixer valve to avoid the aforementioned risk, that would make the system too dependent on everything working correctly, and difficult to repair when it did not. I've experienced failure (early 2012) of a solenoid valve which caused a failure in the pump, which then caused a leakage failure, which then required scaffolding and new pipes and fittings to repair. With the possibility of higher circulating temperatures there is a higher risk of expansion, and leakage through joints. The use of the ground loop as a ‘damper’ is very safe by keeping temperatures low. Solenoid valves can be omitted, with much simpler check-valves employed to make sure that the liquids take the correct route around the circuit.